as an oldschool graphic designer all my Books, Magazins and Flyers start's with a intelligent grid thats give me the reference, that all sites/styles etc in the same manner and style. I always prefer a 12 column grid or a 9 column grid. Thats give me flexibility but also some borders for a consistent style. I'am so strange that I love to perfect the position of the columns without decimal points, so I have the posibility for a fast perfect position with coordinates. For example see the screenshot. Without this grid I also can use MS Word for a Layout (thats also can Handle grid in a Textbox, but this is not a flexible and fast way to work), so please add a column grid option. Oh and if you use Quark 3.32 as a Basic reference would be awesome, I never worked so fast as with this Program thats all reduced to the basics. A good grid system (like the one above) is absolutely necessary for professional layouts. I was also somewhat dismayed that there was no grid system baked in from the beginning. Being able to set columns from within a text frame is nice, but really doesn't allow you to visualize the page as a whole, especially if you will have multiple stories and graphics on the same page... think newspaper, or the excellent example provided by 3joern above. A reasonable lattice system as in Indesign would be the only thing I really lack. It *is* absolutely necessary for professional designers. A page grid, as shown by 3joern is so fundamental that it's hard to understand how this was not recognized and "baked in". as an oldschool graphic designer all my Books, Magazins and Flyers start's with a intelligent grid thats give me the reference, that all sites/styles etc in the same manner and style. I always prefer a 12 column grid or a 9 column grid. Thats give me flexibility but also some borders for a consistent style. I'am so strange that I love to perfect the position of the columns without decimal points, so I have the posibility for a fast perfect position with coordinates. For example see the screenshot. 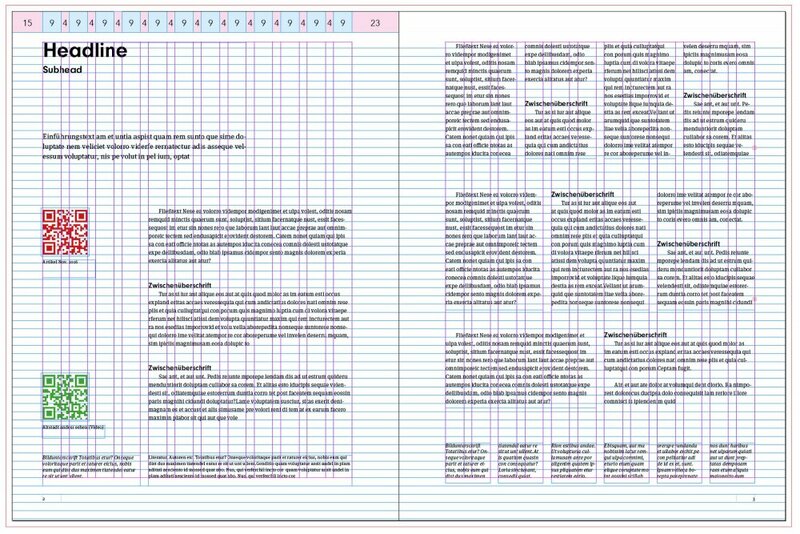 Without this grid I also can use MS Word for a Layout (thats also can Handle grid in a Textbox, but this is not a flexible and fast way to work), so please a a column grid option. This is exactly my wish: a professional grid system for Affinity publisher. Except it would be cool if that grid also allowed for subdivisions in the other direction, i.e. not just columns like InDesign, but also rows. How has one of the threads asking for this not been stickied yet? It's got to be one of the most requested things. It seems so absolutely core to the concept of a layout programme. I get that everyone thinks that about different features, but seriously, how can anyone not miss this? seriously, how can anyone not miss this? Probably because many of us build those grids manually. In Affinity, because you have to? Or you've always done that in InDesign or whatever you were using before? I found I had to fiddle a little with the snapping settings to make snapping work. Preset 'Object Creation' together with 'Candidate List' seems to work. I'm not saying the feature request is not neccessary. I just try to find a way to help myself and other forumster. On a second thought I exported the grids as assets. They failed to load into AD 1.6.5 most likely because they were created with a 1.7 line program (APub). I post it here as an attachment (180 KB). Those are of A4 page size but it should be possible to adjust to other page sizes as well. Let me know if this works. I also just struggeled , searching for a way to evenly distribute some images on my page.. horizontaly and also vertical..
What we need is realy something as show above , or something like a "Gridobject" you can free position on your page and even nest another gridobject inside..
untill now.. its slow, unintuitive and difficult to distribute your content on a page..
That is, what I am saying. But for some of us it may work for the time being. Yeah, it would be a way of getting the job done, so thanks for sharing. It just seems like more effort when I'd already be facing rebuilding all my templates from InDesign. mit dem Panel 'Grid and Axis' kann man im Ansatz Raster erstellen, die genutzt werden können. Aber im Falle eines Rasters, wie es der OP (original poster) meint, gibt es Spalten mit Abständen dazwischen, die eine andere Breite haben. Außerdem soll das Raster nicht am linken Seitenrand beginnen, sonder z.B. am linken Rand des Satzspiegels. Beides geht mit 'Grid and Axis' (noch) nicht. Trotzdem ist der Ansatz, die Aufgabe mit 'Grid and Axis' zu lösen m.E. richtig. Nur eben noch nicht implementiert. 'Grid and Axis' is capable to create a basic grid and that can be used already. But the OP wants to create a grid with columns that are seperated by little seperation coloums of different width. And the grid's origin should not only be the left page border but also e.g. start at the left margin. These both are not possible with 'Grid and Axis' currently. I believe 'Grid and Axis' is the right tool for the task. It's just not there, yet. The "Create Guides" function in InDesign is one of my favourite and most-used features in that app. I create a lot of column/row based basic grids, sub-grids, and after installing Publisher and running it one of the very first few things I expected to find was a similar guide column builder, but to my astonishment it wasn't there. However, Publisher falls utterly flat on its face due to how the handling of guides is integrated. The reason why InDesign's guides work so wonderfully well is very simple, yet effective: guides are treated just like any other object, and are attached to the selected layer you happen to be working in. This effectively means an entire system of grids and sub-grids and helper guides may be built, organized, and maintained through multiple layers. And the colours of individual guides can be changed as well allowing for very intricate and useful nested layout grids to be built. Publisher's guides are treated like "special" things that do not "live" on any particular layer, but instead are always put in an invisible guides layer over which the user has little or no control. All guides are on or off, and cannot have individual colours, or be managed in groups/layers at all. In short, nigh on absolutely useless for more complex layout grids. Having access to only one hidden guides layer is SO ill-conceived that I wonder if the developers actually discussed basic layout techniques and workflows with magazine and book designers and creators. Only allowing for one singular fixed guides "layer" is a fundamental short-coming of many layout apps. Not offering a good column/row generator either is a second unforgivable mistake from the perspective of anyone laying out semi-complex layouts on a daily basis. The combination of these two missing options in a new young DTP contender on the market is very, very unfortunate, automatically ruling it out for me or anyone even remotely interested in elaborate grid-based layouting. And even if Publisher received the best grid builder in the world, the lack of layer-based guides in this version would make it rather of limited use anyway. The two go together hand in hand. Seeing how the guides are implemented on a rather low level in the apps architecture, I don't expect the Affinity developers to re-code this any time soon. At least, I really, REALLY want to be proved wrong here. If these fundamental shortcomings aren't taken care of at some point, Publisher will remain of quite limited attraction to myself and fellow complex layout grid "layouters". What a shame this would be. Also, guides ought to have an option to be formulaic: for example, the guides builder in PhotoLine not only allows for guides to be built on the basis of a layer's object size and on selections, but also includes the option to create formula-based guides which automatically update if the scale of the document is changed. For example: (2 * (h)) / 5 - 0.5 cm where h is height. Now, that IS handy, I can tell you.